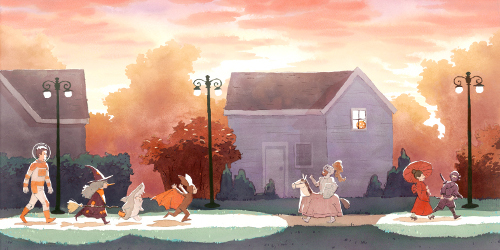 It’s almost Halloween, y’all. What are you going as? I’ve got some Halloween-esque illustrations today. I’m opening with a piece of art that arrived in my mailbox this week from Ashley Wolff. Remember this beautiful 2012 picture book of hers? Well, here’s Baby Bear again, this time exploring orange, I suppose, with his pumpkin. I love it, and I thank Ashley for this and for letting me share it here today. 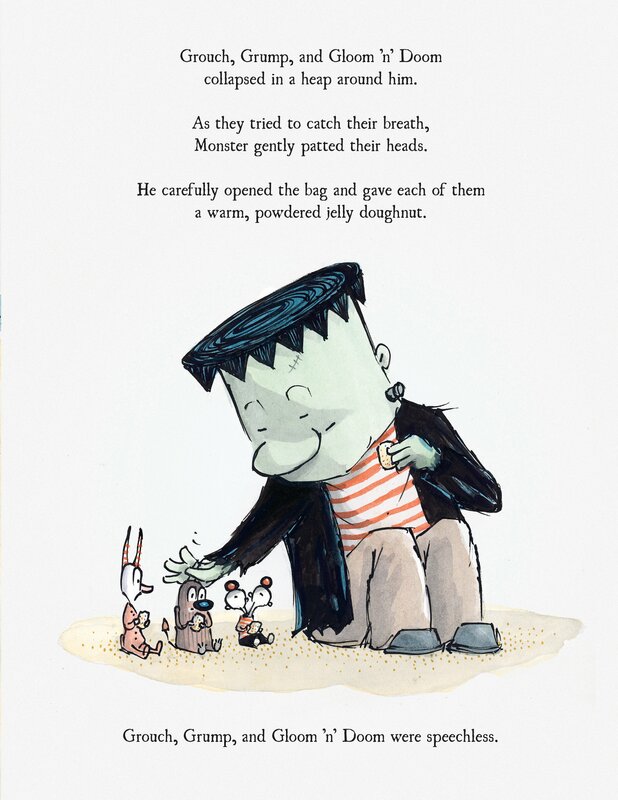 McDonnell’s The Monsters’ Monster, released by Little, Brown in September, is the reason my girls and I have been walking around, saying “DANK YOU!” very loudly all week. This is the very funny story of Grouch, Grump, and little Gloom ‘n’ Doom, who “thought they were monsters.” See these tiny guys to the left? (Can you guess which might be Gloom ‘n’ Doom?) They live in a “dark monster castle, high atop a dark monster mountain, overlooking a monster-fearing village.” Filled with monster thoughts and lots of grump and bad moods, they argue over who’s the scariest and biggest and baddest. One gets the sense they’re rarely, if ever, actually threatening. To settle the argument one day, they create a monster, whom you see pictured above. McDonnell builds the tension as the monster springs to life and reaches toward them only to … well, to say “Dank you!” and proceed to give them a giant monster hug. 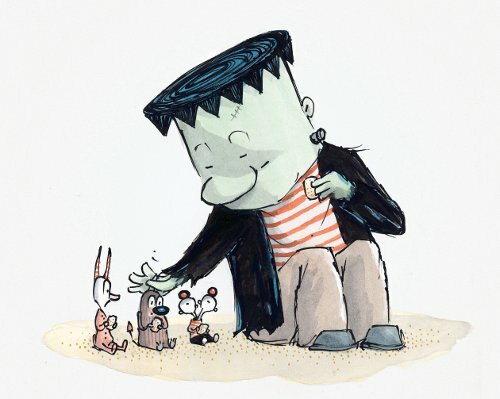 Turns out he’s a big softie, and McDonnell pulls off the humor of all this to great effect with his illustrations: The monster is big and bulky, but demure and unassuming. And, as you can see above, he’s simply thankful to be alive. 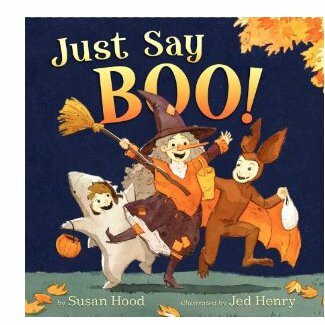 Last, but not least, is Susan Hood’s Just Say BOO!, released by HarperCollins in July and illustrated by Jed Henry. Hood writes with a gentle rhythm and pleasing repetition, inviting readers to participate in the story. If I may add quickly now: I’ve seen an advanced copy of his January 2013 release, called Cheer Up, Mouse! and I love it so. More on that early next year. 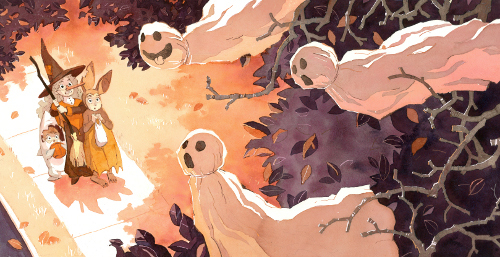 Here are some more of Jed’s Just Say Boo! spreads. Enjoy. THE MONSTERS’ MONSTER. Copyright © 2012 by Patrick McDonnell. Published by Little, Brown and Company, New York. Spreads reproduced by permission of the publisher. JUST SAY BOO! Copyright © 2012 by Susan Hood. Illustrations copyright © 2012 by Jed Henry. Published by HarperCollins, New York. Spreads reproduced by permission of Jed Henry. 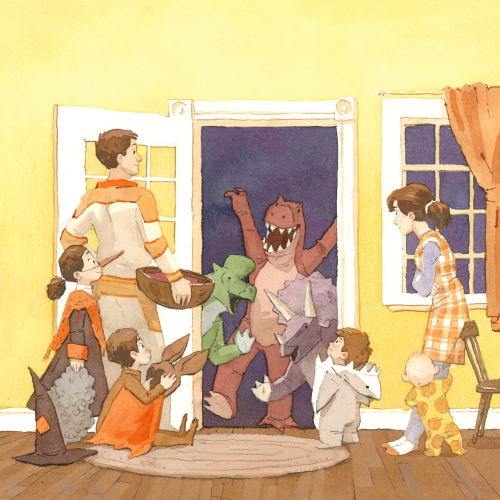 If you haven’t already seen this link, whose goal is to support author/illustrator Aaron Zenz’s family in a time of real need, please consider visiting it and donating. And, local friends, Nashville Public Library’s Library Pete has a project that needs funding, and I can’t think of a more deserving literacy supporter. Here’s the info. 1) Manuscript revisions! My co-author Betsy and I are awfully, AWFULLY close to the due date, and things are going well. At least in our heads. Of course, ultimately what matters is what our editor thinks when she reads what we consider a new and improved manuscript. So, fingers crossed. 2) Did anyone else see “Sad Mouse” on SNL last week? I liked it. 3) I was happy to read Andrew Bird already has a new CD, currently streaming here, and track #6 makes me so happy. It was recorded like this below — musicians gathered around only one mic in a farmhouse or some such wonderful set-up. 4) Yesterday, we voted early. I enjoyed explaining to the girls why it’s a privilege to vote. 6) Noah Gundersen’s music is in my immediate future. He’ll be performing in Nashville tonight. 7) I love this post about libraries from Adrienne Furness. Congrats on the manuscript getting closer to finishing, Jules. We should have a 7 imp virtual party when you’re done! And what a cool collection of books today. As I think I’ve mentioned we don’t really celebrate Halloween here but it looks like it would be great fun to have all those decorations and costumes. We bought some stickers to go on the windows to put up on our holiday but it is not quite the same. 1. I don’t know if I’ve mentioned it before but one of the things I love about Brisbane are the painted art traffic signal boxes. Some are by professional artisits but I think most are by local people. They are a great use of otherwise dull civic property. 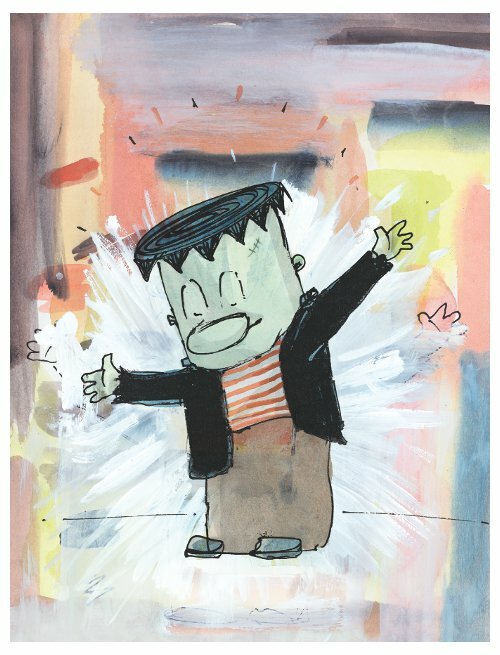 This year I am reading monster books to,Forster graders during October. Looks like I have found a new one in The Monster’s Monster. Jules, thanks for the poetry links and congrats on finishing the revisions. And the new fairy tale book sounds fab. Emmaco, thunderstorms and finding bird nests sound lovely. 2. Oldest grandgirl who has a list of things we will do at my house. 3. Oldest grandgirl spent the night Friday. 4. Teaching oldest grandgirl how to make tissue ghosts. 5. Poetry book exchange with Irene Latham. 6. Downton Abbey season two. 7. Book club tonight: Silver Sparrow by Tayari Jones. the sparrowhawk and the farmer’s cat. or his clear and forest-filling trill. clutching updrafts as a boy holds a book. Emmaco, no, please don’t get washed out to sea. We like you too much. … I love your public art theme today. So MANY of those painted art traffic signal boxes. And I can’t get past this notion of guerrilla knitting. Really? Some people have done that? I have never heard of such a thing. That is kind of amazing and largely wonderful. It’s so this book, too. I want to share that with the world. Jone: I have trouble imagining how you wouldn’t love The Monsters’ Monster. Let me know if you read it to the kiddos. So glad you had good grandgirl time, and have fun at your book club. Steven: Ooh. I like that one. I wish my brain worked like yours, seeing poems in so many things. I hope those of you on the East Coast and thereabouts are safe and sound. Good morning, Jed Henry, Patrick McDonnell, and Ashley Wolff! Thanks for sharing your art with us. Thanks to Jules and those who created and are supporting the fundraiser for the Zenz family. Yay for your final revisions, Jules and Betsy! Jules: I posted my review of Philip Pullman’s Fairy Tales from the Brothers Grimm just a few days ago! emmaco: I’ve heard the expression “yarnbombing” before, but this is the first time I’ve heard “guerilla knitting” – ha! Hurrah for the new trees. Have fun and be safe out there. Jone: Enjoy your time with them, as always. Have fun at book club! Steven: Hello to the birds. 1 and 2) I auditioned for a film yesterday and I was offered the part a few hours later! First rehearsal today. Can’t wait to meet the others. 3) Auditioning for another film today with a creepy-cool premise. 7) My friend, who is so much stronger than she knows, and the wonderful things I know will be coming her way, because she deserves nothing less. Little Willow: I love your last kick. But CONGRATS on the role, too! And break a leg today. How awesome was the Shaun of the Dead reading? Jealous you got to go. Thanks for the review link, too. Iron Heinrich has always been one of my favorite characters, and I think he needs his own novel. I personally own both the Halloween books you’ve highlighted; great additions to the holiday fare. Plus I love the Ashley Wolff print. I am glad you and Betsy are getting those revisions whipped into shape. What a relief it must be. Emmaco: I’m glad you enjoyed the kayaking. I love doing it on the smaller rivers in my area. Jone: I do enjoy my monthly book club. Hope yours went well. 6. The roofing contractor from the dark side is done and has left. Jules: Thanks! I look forward to seeing what this new week brings. 🙂 The Shaun of the Dead reading was tons of fun. How had I never heard of Iron Heinrich until now? How? Margie: Hi, as always, to Xena! 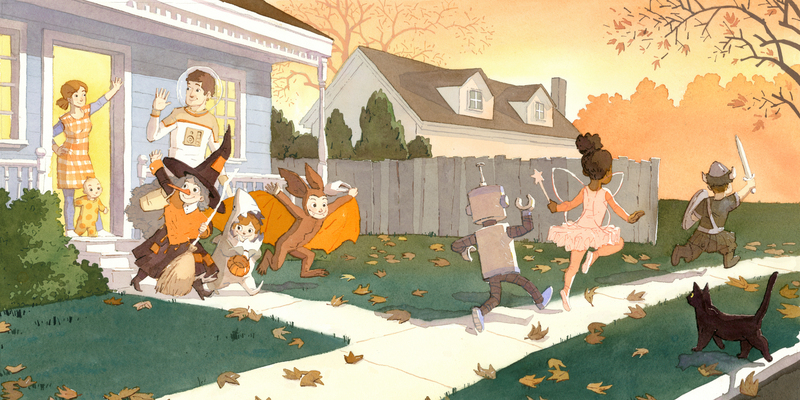 Love the Halloween-inspired books and art this week! emmaco – oooh, those painted art traffic signal boxes are great – how fun to be able to see them everywhere. Happy kayaking and birds’ nest hunting! Jone- making tissue ghosts with your granddaughter sounds like perfect rainy day Halloween fun. Have a great book club! LW – congrats congrats congrats!! Keep us posted. And way to be a great friend. Margie – the rose with the snow, what a lovely image. Happy walking with Xena. 2) Exhausting but productive week at work – happy its over. 3) A good catch-up phone call from a friend. 4) “Days of Blood & Starlight” by Laini Taylor, the sequel to “Daughter of Smoke & Bone” is available in 9 days! I’ve been waiting for this one. 6) Reading, “Let’s Pretend This Never Happened,” by Jenny Lawson – parts of it are laugh-out-loud funny. Have a spooky treat-filled week everyone! My seven kicks this week was Seven Psychopaths, especially Christopher Walken. As far as I’m concerned, his face is about as close to a work of art as a human can get. As always, your blog is the blog of all blogs. Just stopping by to say, “Hello”. I am busy getting ready for a couple of very windy days around here. I don’t want to be tripping on any toys or laundry in the dark. I also don’t want to watch the gas grill fly by Wizard of Oz style. If I get a chance to come back later and kick I will. Margie: Mossy is new to me. I’ll have to look it up. Love that stubborn rose! Little Willow, as you know, I just figured out you were one of the readers and not just in attendance. Der. Rachel, I drooled in my mouth a little, reading about those cupcakes. Hope your weekend’s been relaxing after an exhausting week at work. … I’ll have to look up that book. Hi, Donna! I wanna see that British cover. And I think YOUR blog is the blog of all blogs. 1. Your book is coming out soon! I look forward to reading it. How long does it take between final revisions and publication? 2. A wonderful afternoon nap. The kind of deep relaxation that can only be had after a crisp fall walk. 3. Time stuck in a small cabin with my family. 4. My daughter read her first real book this week…Green Eggs and Ham. This should probably be #1. Very exciting. 5. Played ping pong with my kids for the first time this morning. 6. Looking forward to sitting down and reading a tall stack of books for my Cybils judgeship….and another tall stack of books as I update my Read Around the World booklists. Hi, Amy. It’s scheduled for Fall 2013, assuming our editor likes what she reads next week! Congrats on the first book-read! WHOA. Enjoy your reading (and coffee)! I didn’t know Patrick McDonnell had a new book out. I MUST see it. I made your Kicks, Jules–hooray and thank you! I am so glad, too, that your edits are moving right along. Emmaco, I feel like you are wild and bold, running around without your cell phone in a case. I am not brave enough to do that, although it must be said that I drop my phone quite a lot. Little Willow, Congrats on the part! That was a particularly exciting set of kicks this week. 1. Finally got an offer on the house. It’s all pending the inspection results at this point, but I’m feeling cautiously optimistic. 2. I went to see a double-feature of Bad Ronald and Don’t Be Afraid of the Dark, both made-for-TV movies from the 70s. They were hilariously bad, particularly Bad Ronald. What a great time! 3. My BFF brought me some potato leek soup this week for my lunches, which was delicious. 4. My library hosted a couple events this week that went really well. 5. I finished reading Every Day by David Levithan, which was beautiful. 6. I just started The Yellow Birds by Kevin Powers today, and it is something. Riveting. 7. I hung out with friends last night–we drank wine and ate popcorn and watched a movie (Hudsucker Proxy, which I had somehow never seen). I needed a simple night with excellent company. I have finally come up for air from all our Hurricane Sandy preparations! Excited to read, read, read during all the predicted days of power outages! That said, I’m a bit disappointed because I had a super fun project planned for Katherine’s class based on this very Monster book. Hopefully, if school is canceled on Wed (as it is already for tomorrow and Tuesday), we will be able to celebrate with Monster fun on a another day. Thinking of everyone in Sandy’s path- stay warm, safe and dry! Little pumpkinhead bear is quite festive. (And how’s kitty, Pumpkinfacehead—did I get that right?) Monster’s Monster looks charming. Vaguely reminds me of the Boris Karloff Frankenstein scene with the monster/little girl/flowers; touching, but unfortunately for that Frank, w/o a happy an ending. How funny that the bat costume in Just Say Boo looks like a recycled bunny costume, ha! And that grey, glow-y street scene is lovely. Jules, I actually teared up watching Sad Mouse; ha-ha! Glad he found a soul mate. I’m cheering you on to the manuscript finish line, Go-go-go! emmaco – guerilla knitting and kayaking, yes. jone – I have to find Dowton Abbey. Enjoy Grandgirl. Steven – “to arrow past, the sparrowhawk and the farmer’s cat.” great cadence. Margie – your roofing contractor line made me laugh. Rachel – Thanks for the Days of Blood & Starlight headsup. I loved the atmospheric DofS&B. Donna – I will never look at CW quite the same. Hello Moira. I’m picturing your flying grill and the Oz Hurricane Song. Da-dada-da-daaa-daaa. Amy – What a fun first book; that milestone IS exciting. adrienne – really enjoyed your blog on libraries. I have to visit that LA one. Stacey – yes, you stay warm and safe and dry as well. 3. writers talking, laughing and referencing so many interesting leads/reads that my notebook stays on the dinner table so I can jot down every one. 4. reconnecting with faces and projects I’m met/read elsewhere. 6. fantastic editor, Stephen Roxburgh. Happy Halloween! Like Stacey said: safe, warm, dry. Have a good and productive week kickers. Jules, that book looks great! You would like the yarn bombing a colleague did a coulpe of years ago, she made sweaters for some kangaroo statues in the city. And I’m glad you are supportive of me not getting washed out to sea. However, I have discovered that it is not that easy to get swept away so perhaps I will be like Margie and venture into rivers someday soon! Margie, what is a roof valley? Is that what you call the dip in your roof or is it the roof of a house in a valley?? Steven, I am not familiar with wood thrushes but I love the poem. Denise, the pumpkin and zoo animal link very cute! I hope all you East Coasters are ok with this scary looking storm!! Adrienne, I think you’ll really like McDonnell’s book. Also, I’m still crossing fingers for the house sell. And hmm…maybe I can read Every Day after 11/5. Stacey, my goodness, please stay safe. Denise, NO WAY? You are in NJ now? Of all the times! Please stay safe. How far are you from the eye of the storm? I’ll have to look up Morristown on a map. I like Emma, the Wild and Bold, too. And, yes, it’s Pumpkinfacehead. He’s fine. Still just as evil as ever. 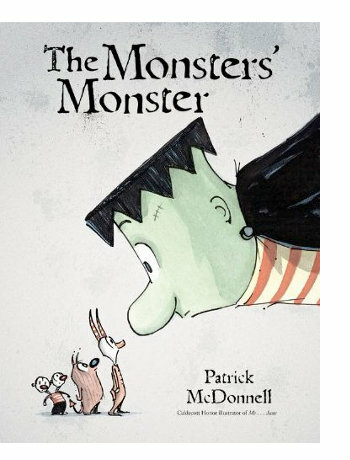 I love Patrick McDonnell and I’m completely smitten with Me Jane….so I’m excited to search for The Monster’s Monster. Jules: Sad Mouse made me smile. Loved the cigarette break. Glad your manuscript revisions are going well. Emmaco: I just discovered guerrilla knitting a few weeks ago here in Birmingham! So much fun. Also, we collect abandoned bird nests. One year for the holidays my 3 girls and I all went hunting for nests and gave them away as presents!! Jone: All your kicks sound lovely…especially the tissue ghosts. Hi to Irene Latham from me. She spoke at the regional SCBWI conference and I purchased her latest book which I’m anxious to delve into. Margie: Roses AND snow! How lucky. Rachel: What time should I come over for a cupcake? Donna One Shih Tzu…Seven Psychopaths! Just watched the trailer and I HAVE to see this. Amy: YAY for first books!! And how can it get any better than Green Eggs and Ham? Adrienne: Potato leek soup sounds delicious…yay friends! Glad things are moving along on your house. Denise: Stay safe and have fun at the conference. 2) Went on a buying spree and bought about 10 picture books at my local bookstore. 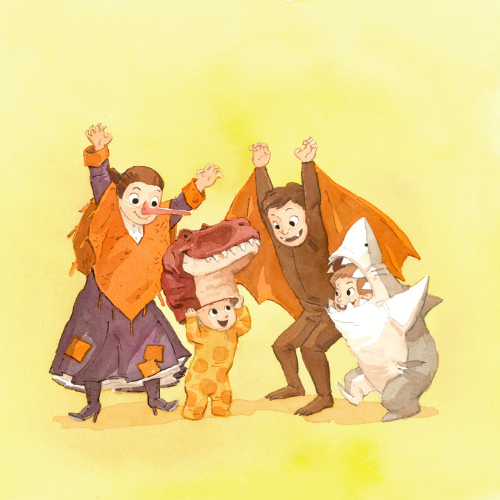 To hell with new clothes…I’ve got new picture books! 3) Watching my dear friend and girl scout leader do yoga, sign language and sing with 40 scouts just weeks after being hit by a car on her vespa. Amazing. 4) chilly breeze here in birmingham…made a fire on Saturday night and the whole family read books. Here’s what we were all reading. Harper (12) Click, Zoe (11) Mysterious Benedict Society, Bella (8) Smurf graphic novel, Kenny (46) Watch repair book, Me (46) The Graveyard Book. 5) Making owl pillows for a school auction and went to our elementary school and put 85 little fingerprints on fabric. 6) Aforementioned friend (scout leader) was named one of the top 10 women in Birmingham for her service to the community and went to a benefit honoring her and 9 other amazing women. 7) Going to the thrift store to stock up on Halloween costume items. This year we have an Octupus, Hagrid and Ron Weasly. Lori: I would LOVE an abandoned nest as a present! Also, I really loved The Underneath, though I realize it was one of those love-it or hate-it novels for so many people. I read it to the girls years ago. I realize so much of … well, the CRAFT of what Appelt did probably went over their heads, but it’s all the more reason to read it again one day (and they seemed to like it). … Are you enjoying The Graveyard Book? We read that recently, and I could hardly read the end outloud for the crying. … I like your costumes, and you have good friends, it seems. I just realized that I sound like I’m requesting you give me a nest, when what I meant is that I get so tired of thneeds at the holidays, that I really, really love your idea! I love coming back to read the kicks I may have missed and I missed many this week. First I hope with all my heart that Moira, Stacey and Denise are safe. This storm has been frightening. Little Willow: Hope the audition for the creepy cool film went well. Xena send doggy kisses. Rachel: Those Halloween cupcakes sound divine. Amy: Time in the cabin is the very best. Lori: I loved the Underneath so much I now own a copy. Emmaco: A roof valley is where the lines meet to create a valley on the roof. I hope everyone is weathering this storm. hey Jules, so glad to be winding through the blog after being absent a couple of weeks… and i LOVE halloween so a good post to come back to;) I like Patrick McDonnells work, will definitly have to pick up that one at the library. Just say Boo looks great too, i like the dusky street lit scene. Your kick #2, I did see Sad Mouse also… funny at first but then really poignant, more so than the original digital shorts (think Justin timberlake;) Also since you have the bit about the brother’s grimm did you hear NPR’s On Point show last week about the newly annotated version coming out? It was super interesting. Hi again, Margie! I also hope everyone’s okay. Mary: I did not hear that On Point show. Thank you! I have Tatar’s Annotated Brothers Grimm. Is there a new one?? I’ll have to listen. Thanks again. … Monster book! Enjoy! Enjoy the chocolate eyeballs, too. Great Halloween post. I loved the illustrations from Patrick and Jed!